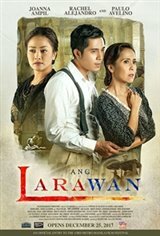 ANG LARAWAN is the musical based on Nick Joaquins play A PORTRAIT OF THE ARTIST AS FILIPINO. In this story about art versus pragmatism set in 1941, two unmarried sisters, Candida and Paula, are in dire straits following the hibernation of their painter-father Don Lorenzo Marasigan. Their father gives them his last masterpiece, which could fetch a huge amount of money and yet the sisters refuse to part with it. That is until their boarder, Tony Javier, presents an irresistible proposition.